The data gleaned from Apple's cardiac health study in conjunction with Stanford has been disclosed, with doctors in attendance positive not just about the study as a whole, but also about the Apple Watch as an additional source of information to diagnose a problem. According to Apple, as well as the doctors giving the presentation at the American College of Cardiology's 68th annual event, many participants sought medical advice following their irregular rhythm notification, using the information as an additional data point for doctors to use in assessing any underlying condition. "As physicians, we are always trying to find ways to offer patients health information that is meaningful to them for individualized care," said Sumbul Desai, MD, Apple's vice president of Health. "Seeing medical research reflect what we're hearing from consumers is positive and we're excited to see Apple Watch helping even more consumers in the future while collaborating with the medical community to further research." The study was originally announced during the Apple Watch Series 3 release event. At the time, Apple noted that it was working with the U.S. Food and Drug Administration on the process. "Through the Apple Heart Study, Stanford Medicine faculty will explore how technology like Apple Watch's heart rate sensor can help usher in a new era of proactive health care central to our Precision Health approach," Lloyd Minor, Dean of Stanford University School of Medicine said when the study launched. 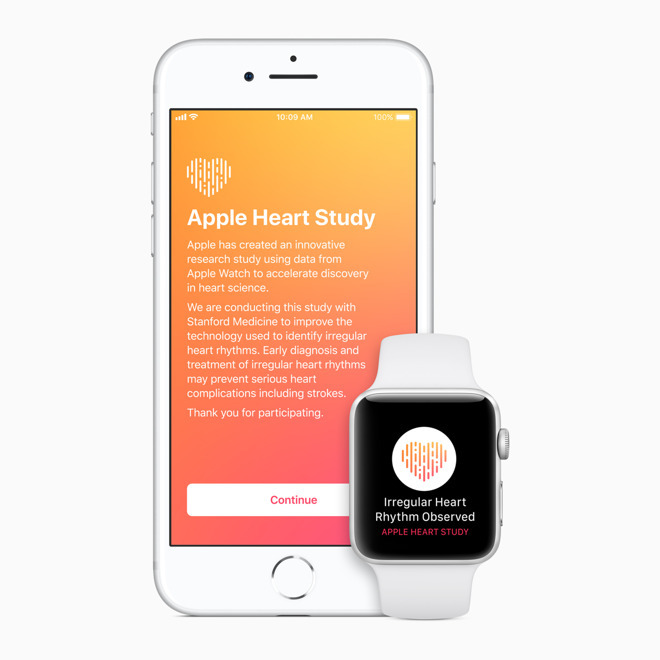 "We're excited to work with Apple on this breakthrough heart study." To calculate heart rate and rhythm, the Apple Watch uses green LEDs coupled with light-sensitive photodiodes to detect the amount of blood flowing through the wrist. The sensor collects signals from four points on the wrist, and uses the data to identify an irregular heart rhythm. During the test, If an irregular heart rhythm was identified by the sensors, study participants received a notification on their Apple Watch and iPhone, a free consultation with a study doctor, and an electrocardiogram peripheral for additional monitoring. Enrollment in the study closed on August 2, 2018. The American Heart Journal previously declared that the study's 419,093 participants made it the largest one of its kind in history. Data collection for the study concluded in January 2019. Since the study's launch, Apple has ramped up its positioning of the Apple Watch as a health accessory, most notably with the electrocardiogram (ECG) feature in the Apple Watch Series 4. Using the app and special sensors in the base and crown, the Series 4 can act as a single-lead ECG reader.